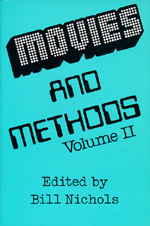 The original Movies and Methods volume (1976) captured the dynamic evolution of film theory and criticism into an important new discipline, incorporating methods from structuralism, semiotics, and feminist thought. Now there is again ferment in the field. Movies and Methods, Volume II, captures the developments that have given history and genre studies imaginative new models and indicates how feminist, structuralist, and psychoanalytic approaches to film have achieved fresh, valuable insights. In his thoughtful introduction, Nichols provides a context for the paradoxes that confront film studies today. He shows how shared methods and approaches continue to stimulate much of the best writing about film, points to common problems most critics and theorists have tried to resolve, and describes the internal contraditions that have restricted the usefulness of post-structuralism. Mini-introductions place each essay in a larger context and suggest its linkages with other essays in the volume. A great variety of approaches and methods characterize film writing today, and the final part conveys their diversity—from statistical style analysis to phenomenology and from gay criticisms to neoformalism. This concluding part also shows how the rigorous use of a broad range of approaches has helped remove post-structuralist criticism from its position of dominance through most of the seventies and early eighties. The writings collected in this volume exhibit not only a strong sense of personal engagement but als a persistent awareness of the social importance of the cinema in our culture. Movies and Methods, Volume II, will prove as invaluable to the serious student of cinema as its predecessor; it will be an essential reference work for years to come.